What can you make with a pound of ground beef? A lot! Here’s a terrific addition to the list. There are endless of versions of meatball kabobs with many different names throughout the Middle East and India. This one, made with walnuts, aromatics, spices, and herbs, is based on a Turkish recipe. Serve them on low-carb flatbread or over a bed of riced cauliflower with yogurt or tahini sauce. Small ones on wooden picks are perfect as appetizers. Lettuce, tomato, and cucumber are traditional accompaniments. These fine-textured meatballs are a snap to make in a food processor; you don’t even have to chop the onion! 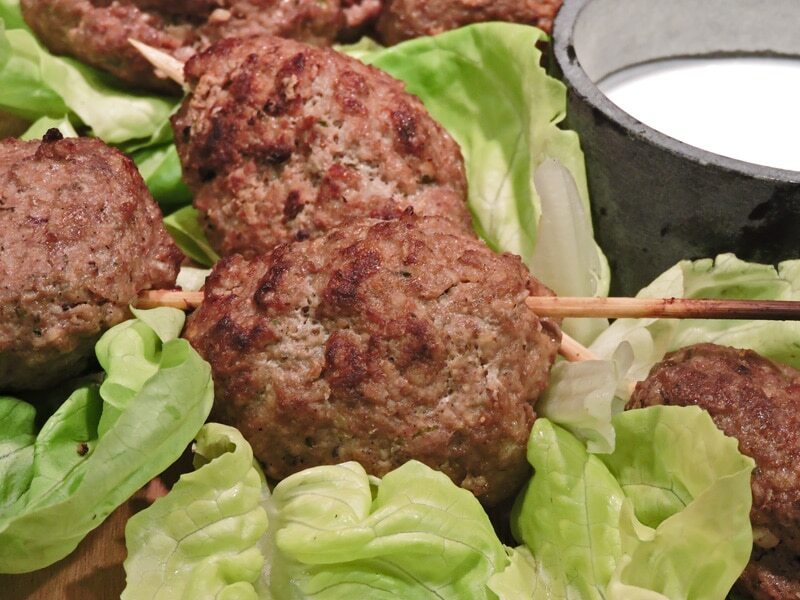 Thread them on skewers and broil or shape into patties and fry in a skillet. Soak wooden skewers in water for 30 minutes (use 8 for regular or 24 for appetizer-sized servings). Place rack about 4 inches from the heating element. Stir walnuts in a dry skillet until lightly toasted, no more than 5 minutes. Grind cooled nuts in food processor until chopped. Add ground meat, onion, garlic, cumin, mint, if using, allspice, cinnamon. cayenne, salt, and pepper and process until will mixed, stopping to scrape down the bowl occasionally as needed. Add egg and process until blended. Add parsley and pulse a few times just until evenly distributed. Shape the meat mixture into 8 to 10 elongated balls (or 24 for appetizer-size servings). Thread them on skewers, one or more per skewer. Broil, turning once, until brown, about 10 minutes total. Alternately, shape the meat mixture into patties and fry in light olive oil or butter in a skillet until browned on both sides. Makes 4 to 6 servings as a main dish, 24 as an appetizer. Data is for broiled kofta, not fried in fat. Appetizers, Kebobs, Meatballs, Walnuts. Bookmark.